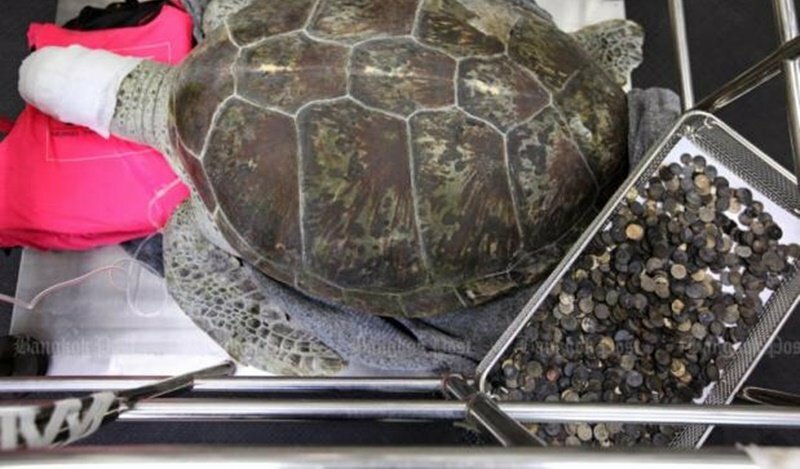 CHONBURI: Veterinarians laboured for seven hours to remove 915 coins weighing five kilograms from a sea turtle suffering chronic stomach ache. “It is hard to imagine how it swallowed such a large number of coins. I’ve never seen such a case before,” said Pasakorn Brikshavana, of Chulalongkorn University’s faculty of veterinary science. They spent seven hours helping “Om Sin”, half of the time scooping out the coins – both local and foreign – from its stomach. The surgeons did not expect the surgery on the unfortunate ailing turtle to take so long – until faced with the huge coin cache in its stomach, which required a bigger cut than they originally planned. Last month, Om Sin, Thai for piggy bank, was sent to the faculty from the Sea Turtle Conservation Centre of the Royal Thai Navy in Sattahip district in Chonburi after it barely swam. A CT scan at the university shocked vets when they saw the mound of coins. It was one of the 26 turtles relocated to the centre from a pond in Sri Racha district in Chonburi after the town municipality planned to renovate the place. The turtle will be under the care of the faculty for one week before being sent back to the centre for full rehabilitation. According to Thai belief, throwing coins into a turtle pond would stop bad luck. How much do the Thais get fined for feeding turtles coins?